Java Open Graphic Library (JOGL) is a wrapper library which allows to use OpenGL with Java programing language. Thus, programmers can easily embed computer graphics in Java code with the help of JOGL. JOGL is an open source library that access the complete APIs of OpenGL. Hence, it inherits all the features of OpenGL. JOGL is capable to perform on any type of operating system such as Window, Linux and Mac without any lacking. What is open graphic library (OpenGL)? OpenGL is a platform independent application programming interface (API) used to draw two-dimensional and three-dimensional graphics applications. Its main focus is to build hardware based objects instead of software. OpenGL APIs interacts with graphics processing unit (GPU) to manipulate and accelerate the creation of images. Thus, these API's are designed to implement mostly in hardware. Originally, JOGL was developed by Kenneth Bradley Russell and Christopher John Kline. Later, it was acquired by Sun Microsystems. Currently, it is maintained by JogAmp(Java on Graphics, Audio, Media and Processing). The Java Native Interface (JNI) is a programming framework that allows Java programs to call or called by native applications and libraries written in some other languages. Thus, Java supports native codes via Java Native Interface. In JOGL, the role of JNI is to provide a platform through which you can access various OpenGL features. 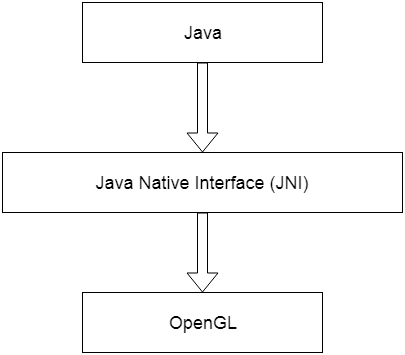 Hence, JNI functions as a mediator between Java and OpenGL.